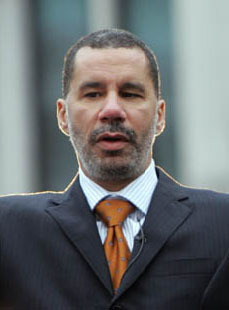 When Eliot Spitzer's resignation took effect on March 17, 2008, David A. Paterson became New York's first black Governor, the fourth black Governor in America's history, and America's second blind Governor (after Bob C. Riley of Arkansas). His father, Basil Paterson, was the first African-American to serve as New York Secretary of State, from 1979-83. Paterson's single half-term as Governor was plagued with missteps and scandal, including a campaign of intimidation against a woman who filed charges alleging that she had been attacked by the Governor's top aide, David Johnson. He began his career in politics working for David Dinkins, when Dinkins was running for borough president of Manhattan. He was elected to the New York State Senate in 1985, representing Harlem, and as a legislator he was a strong proponent of alternative energy, minority- and women-owned businesses, stem cell research, and preventing and punishing domestic violence. In 2002 he became Senate Minority Leader, and in 2006 he was elected New York's Lieutenant Governor.